Only one football coach ever led both Lehigh and Lafayette to victories in the Rivalry. In 1898, suffering through Parke Davis' final season, the head coach that had led Lafayette to the heights of natonal prominence brought in four different coaches to find a way to beat Lehigh in their second meeting at the end of the season. One of those great football minds Davis brought in was Dr. Sylvanus P. Newton, a former Penn football player, Phi Beta Kappa scholar and expert football strategist. Dr. Newton played a critical role for Lafayette in a slushy ice bowl in 1898, using the talents of their kicker, Ed Bray, and an ingenious way to deliver free kicks. "Captain Best, the holder, and Bray, the kicker, scraped away the four inches of slush and snow so the ball could be placed on the ground for an attempt," the book Legends of Lehigh/Lafayette tells us. "The visibility [on the 35 yard field goal] was so poor that the crowd at first was silent, not knowing exactly what had happened. Several minutes later, the word spread that the kick was good, and the crowd exploded for the amazing feat (or foot) of Ed Bray”. The use of Newton's placement kick - his own invention - “made such an impression upon those in charge at Lafayette that he was invited to be their coach the following fall,” Francis March wrote in the book Athletics at Lafayette College. Sylvanus, or Samuel, as he was also known, accepted, and didn’t waste much time building on Davis’ building blocks to return Lafayette to the national limelight. “He talked football during the day, and dreamed football at night,” March fondly remembered, also calling him the cleverest head football coach that Lafayette has ever had to boot. His innovation of the placement kick revolutionized the game, increasing scoring and changing the risky nature of scoring from the foot. He also brought with him an important mass momentum play that had, briefly, lofted Penn to the top of the football world: the “guards back” formation. An old Boston Herald article details the brutal, mass momentum formation. Then the ball would be snapped to the quarterback. With Dr. Newton guiding the “team work, not star work”, as he was fond of saying, the Maroon and White quickly remained in the national picture. The Maroon and White coasted to a 12-1 season in 1899, their only blemish a 12-0 loss to Princeton. Their new “guards back” formation plowed through most of the teams on their schedule, including both games against Lehigh, 17-0 and 35-0 respectively. “The story of Lehigh’s defeat may be told in these few words; guards back did it all and the inability of our line to stand the continuous plunges of “guards left” and “guards right” explains the result,” The Brown and White reported. Newton guided Lafayette to back-to-back 9 win seasons in 1900 and 1901, not only beating Lehigh soundly, but shutting them out each time, as the Brown and White had no answer to “guards back”. Newton was a man that inspired his players greatly, but he was also a sarcastic, sharp-tongued coach that frequently bruised the egos of his players, too. "During Newton's three years at Lafayette," March wrote, "every captain and every manager of the Lafayette football and baseball teams during that period, with one exception, sent in his resignation to the graduate manager. This meant usually a good deal of diplomacy before the matter was settled up and usually ended in a greater attachment than ever between the coach and the offended captain or manager." Newtown guided Lafayette to strong records in 1900 and 1901, only losing to national powers Penn and Princeton in their college competition. The big-time colleges, competing frequently with paid players and "tramp athletes", could not be overwhelmed by "guards back", though Lafayette competed well with them. In 1902, though, Lehigh boosters would find the only way possible to slow down Lafayette – they gathered up enough money to double Dr. Newton’s salary, making it one that Lafayette could not match. At the time, there was no ruling structure to keep outside entities from hiring another team’s coach, so if determined boosters wanted to pool their money together to do so, they could. The ploy by Lehigh’s boosters paid off immediately. "His strong experienced manner of taking hold of things has inspired great confidence," The Brown and White reported. "He has taken the material at hand as no man at Lehigh ever has. He has gotten out men who would never had thought of coming out. He came here in the latter part of August, and has had from twenty to thirty men out every day since. If these are not ideal conditions, what are?" An interview with Newton before the 1901 season, though, painted a different picture. "Counter attractions and duties have so interfered with foot ball that but little has been gained so far," he wrote. "The majority of the men have doen their work in a half hearted way which bodes ill for a successful season. They are willing to play foot ball when it doesn't interfere with their personal comfort and pleasures." He spared nobody in his opinions as to what was wrong at lehigh. 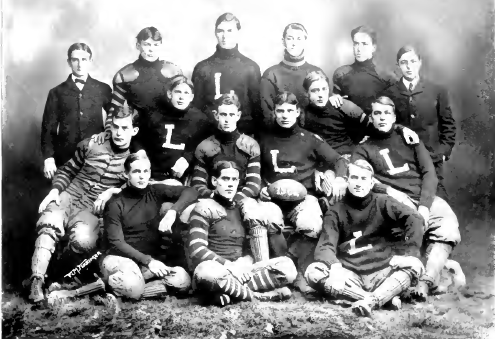 "In addition to a lack of college loyalty," he continued, "there is a missing link in the system somewhere which has resulted in Lehigh foot ball players being compelled to meet the accidents of the game most miserably prepared in the way if uniforms and appliances for protection, and the management has been obliged to confront many would-be candidates with the startling information that clothing cannot be given them." For the first time, Lehigh and Lafayette elected to only play each other once a season. One reason, according to the book Legends of Lehigh/Lafayette, is the fact that the game had grown so violent and so injury-riddled that it was so detrimental to both sides to play two games, only one was deemed practical. After early, expected losses to Penn and Princeton, Newton’s keen football mind and inspirational manner guided Lehigh to a thoroughly unexpected 7-2-1 record – and most importantly, gave the Brown and White the upper hand against Lafayette, 6-0, in the only game they played that season. The crowd of 1,400 Lehigh fans took the L.V.R.R. special to Easton quietly, according to The Brown and White. "In the front car was the forty-six strong, faces cut and bruised and artisitcally decorated with the occasional black eye. Little talking here, either." From the station, the team, after changing in the Lafayette gymnasium, joined the fans in marching up the hill to Lafayette, the band singing "Everybody Takes His Hat Off to Lehigh." "A few minutes of waiting, a few interchanges of cheers, and the teams on which the hopes and the joys of the rival colleges depended trotted quickly out on the field," The Brown and White said. "Clad in rusty jerseys, stained with the dirt of nine hard-fought games, the Lehigh team looked more business-like than handsome." The two teams were evenly matched: Lafayette's bigger, better athletes, and Lehigh's well-coached team, using Lafayette's old playbook against them. It would come down to an old play that Lafayette knew was coming. "Captain Andy Farabaugh gave the signal for 'close formation'", The Brown and White reported. "William Brush, left end for Lehigh, seized the ball, slid cautiously around the struggling bunch of legs and arms, and was down the field like a flash. Raub, winner of the 220 yard dash for Lafayette last year, was after him in an instant. Only thirty yards to fo and Raub gaining at every step." "At the 5 yard line," they continued, "the Maroon and White arms went out and caught the Brown and White stockings. In a moment both men had fallen and were rolling over and over from the momentum of their run. When they finally came to rest, the ball was planted two feet over the coveted goal line of Lafayette." It would be the only scoring of the game - Lehigh's first points against Lafayette since that fateful game in 1898 - and it would be enough to win the game, causing the Lehigh fans to rush the field to surround their team. "No [victory] bell sound came from the belfry," The Brown and White said, "which had so ofter sounded the knell of Lehigh hopes. Nothing was heard but the funeral echoes from the field, where the sons of Lafayette were singing their Alma Mater with grief in their hearts." Newton was proud of his team, too. "The victory was the outcome of a season of hard and faithful work," he said. "Lehigh played better ball, deserved to win, and did. To the men of the football squad and to the coaches who have so unselfishly given us their time and advice the University ows unlimited thanks and praise, and so do I."